"The Future of the Rural Health Innovation Collaborative" will be the topic of an Indiana State University Community Semester event on March 18. Local higher education officials, community leaders and health professionals will discuss the vision for how the Rural Health Innovation Collaborative will improve the quality of life for Terre Haute residents and surrounding rural areas. Panel members will also discuss why Terre Haute chose to engage in the RHIC initiative and what characteristics of the community are likely to contribute to its success. "The Rural Health Innovative Collaborative is an exciting and transformative partnership between higher education, the health care community, business and the greater Terre Haute community as a whole," said Nathan Myers, assistant professor of political science in Indiana State's College of Arts and Sciences and a primary organizer of the event. "I felt that the Community Semester would be a great opportunity to highlight the role that the RHIC will play in bringing key stakeholders together and making Terre Haute a healthier, more prosperous, and more sustainable community." Myers noted that "Our Town" is the theme of the college's Community Semester initiative and departments in the college are sponsoring events that emphasize engagement between Indiana State and the local, state, national and international communities. Launched in 2008 to build on Terre Haute's position as a center for innovation in rural health care, the RHIC develops and implement health care policies and procedures for the unique needs of under-served rural communities and provides inter-professional education for current and future health care providers. The collaborative of 10 education, health care, government and community development partners is also working to revitalize a Terre Haute neighborhood that lies between the Indiana State campus and Union Hospital. The RHIC update is scheduled for 7 p.m. Monday, March 18 at the Landsbaum Center for Health Education, 1433 N. 6 ½ Street. In addition to a panel discussion, the RHIC Simulation Center will have three human patient simulators on hand for the event as well as its Anatomage table, which provides 3-D images of the human body for anatomy and virtual dissection labs. The RHIC's Anatomage is one of only a handful in operation in the country. 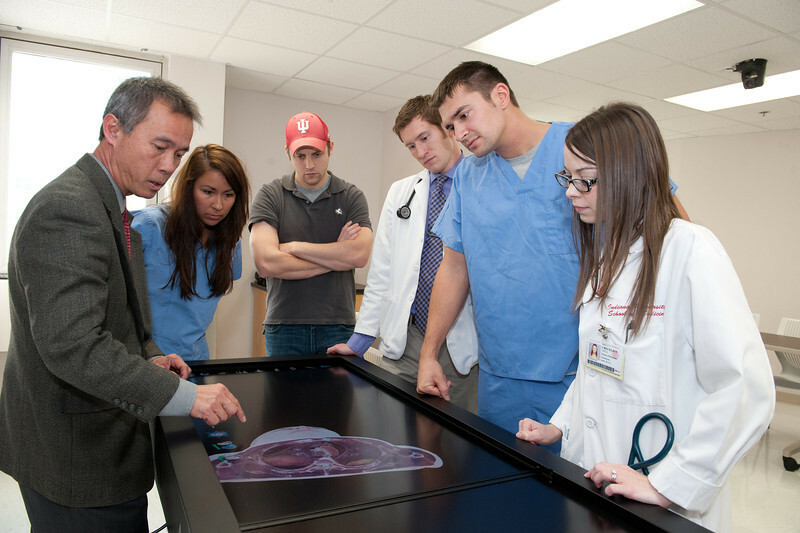 Photo: http://isuphoto.smugmug.com/Other/ISUphotoservices/Simulation-Center-Union/i-Tvk7nHk/0/L/Simulation_Center-3585-L.jpg - Taihung "Peter" Duong, director of the Indiana University School of Medicine-Terre Haute, demonstrates the Anatomage human anatomy table for students from Indiana and Indiana State universities and Ivy Tech Community College-Wabash Valley. The Anatomage and patient simulators from the Rural Health Innovation Collaborative Simulation Center will be on display during a March 18 Community Semester event at the Landsbaum Center for Higher Education.